The best type of tank for these species should be 10 to 20 gallons. This is big enough to house both hatchlings and full-grown adults of these species. It is also enough space to house 2 leopard and crested geckos. You should note that using a very large tank is not advised. This is because such a tank makes the animal stray away from the light hence it is unable to receive enough UVB light for calcium synthesis which can lead to a weak skeletal structure. Such a big sized tank can also make them stray away from the hide box. Confining them in a tank that fits their size is advised. You can also use plastic tanks despite the fact that this type of cage reduces the visibility of individuals from outside. The type of the cage or the tank that you use should not be less than a foot tall. This is because these species of lizards like climbing hence they will need enough vertical space for their operation. If space is less, it makes the unhappy and less comfortable. It also makes them less active which contributes negatively to their health. It might not be possible to replicate a natural environment but giving them an environment that is close enough makes them very comfortable. Moreover, you should take enough time to look for a lid for the tank. The kind of lid that you should look for should be able to support light fixtures. This is because you will need to mount a bulb or lamp at the ceiling. The mounting surface for the lamp should be good enough hence looking for a good lid is very vital. Furthermore, the lid should be able to allow ventilation for air to flow through. Keep away from ventilation that completely seals the tank without leaving a ventilation space. Another vital thing about the nature of the lid that you will look for is the kind of lid that can keep away predators. Animals like cats like feeding on lizards and other small rodents. Having a leopard or crested gecko in a tank in the house catches their attention and they may start to look for a way to catch them. A weak lid allows the predators to have access to the inner side of the cage for crested gecko hence killing your pet. A tank lid that can prevent this is very necessary. 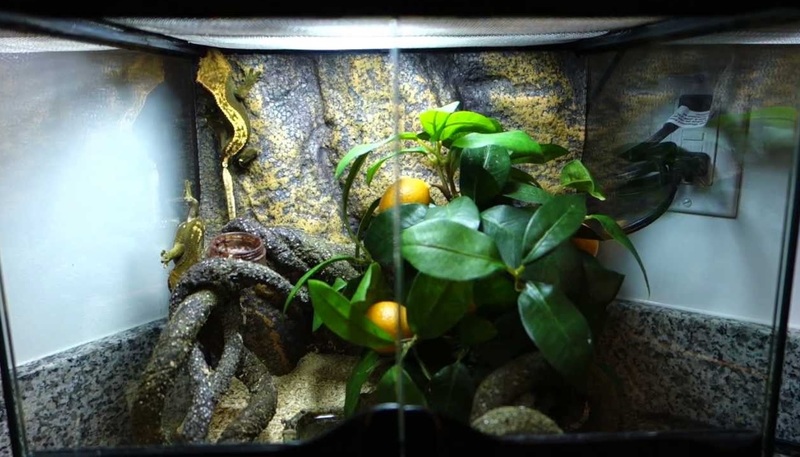 It does not matter the nature of the enclosure that you will put your leopard or crested gecko in. what matters most is the size and the safety provided by the cage. A good tank is the one that does not have a very big horizontal space and at least a foot of vertical distance. Essentially, this tank will be good enough for the comfort and health of your animal. Make sure that the tank has a good lid that can keep the predators away and that which can allow ventilation and light fixtures.